As many of you know, in January we moved to the scrapbooking bed and breakfast that we have owned for the past five years. Prior to the move we lived in Dallas. With the move came a huge amount of downsizing. We gave most of our possessions away because we just plain did not need two households of stuff in one house! With all that downsizing came huge scrapbooking product decisions. I was moving from a large house where I not only had an oversized scrapbook studio, but I also had managed to overtake all the closets on the second floor of our house. I would no longer have such luxury, so I downsized my scrapbooking supplies too. My new creative space was carved out of a bedroom which sleeps five lovely ladies every weekend. So I had to be clever when it came to storage. My husband took out a closet and we used that space for built in cabinets and a countertop. So that is my stand-up space. The room also has a cozy little nook where I have my sit down space. I work on the computer and stamp and color in this space. Now on to my weird little angled closet. It was a total nightmare for storage. But I spent all of yesterday figuring it out....and purging a little more. It is such a strange space that I really was not able to get a picture of the whole closet. The part you can't see is to the left of my Stampin' Up ink pad holder. 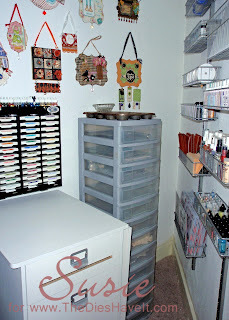 There is a tall Iris storage tower just like the one on the right. I have two Elfa storage racks on the right. I can still add a few baskets to each and probably will. I have inks and sprays and ribbon and stamps in these baskets. These are all things I was having to dig for and thus had stopped using them. 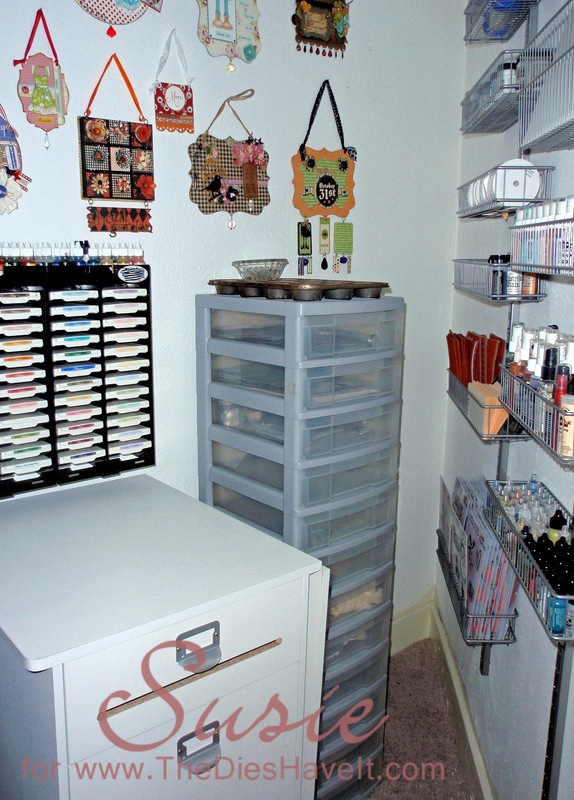 My Iris towers have various supplies in them and some of the drawers are reserved for items for design teams I am on. I need to keep them separate. The rolling cart (from Michael's) actually rolls on out of the closet every Monday and stays out until our guests arrive for their retreats. I use it as my die cutting center. My Vagabond is right at home here. I resisted the urge to put shelving on the back wall. There is room....but it would only encourage me to store things there. I am trying NOT to store things....but to use them. So for now.....I just used that wall as an art gallery. I am thinking I will show you more of my crafting space soon. We all have storage challenges and maybe we can encourage each other to find good solutions!! I will see you tomorrow. I have a fun project to show you. This is just fantastic! Love your small space. I'd better not send you too much product and clutter it up!